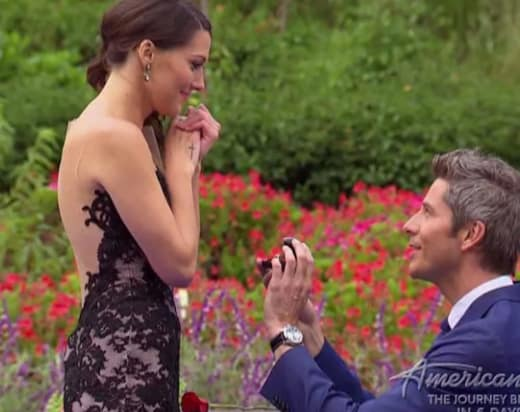 The Bachelor Spoilers: Are Arie and Lauren Together?! Wow. That about sums up The Bachelor finale last night, which played out almost entirely how The Bachelor spoilers predicted. The only twist? A gut-wrenching 40-minute unedited scene where Arie Luyendyk Jr. blindsided Becca Kufrin with cameras rolling. … then immediately continued obsessing over Lauren Burnham and decided to call off their engagement in a matter of weeks. Three hours of raw, uncut pain showed us Becca’s heartbreak and shock, but what happened next still remains to be seen. Arie dumped Becca because he still wanted Lauren. But did the beautiful blonde feel the same way? Are they together now? … Yes. Somewhat incredibly, considering that he rejected her for another girl after she struggled to open up but eventually did. According to Bachelor spoiler god Reality Steve, Arie reached out to Lauren on the telephone the night of the season premiere. Becca referred to this last night, after Arie mentioned that he still had feelings for Lauren which he was open with Becca about. Still, she had no idea he was going to end it, which he did the second weekend in January – the footage we saw on the finale. He then went to Lauren’s family home in Virginia Beach, Va., to win her back, or at least go down swinging, on January 16. Curiously, but perhaps not coincidentally, up until January 16, Lauren didn’t post too much about the show on her Instagram. But after Arie reunited with her and begged for a second chance, she began posting about it, and hinting at their relationship. 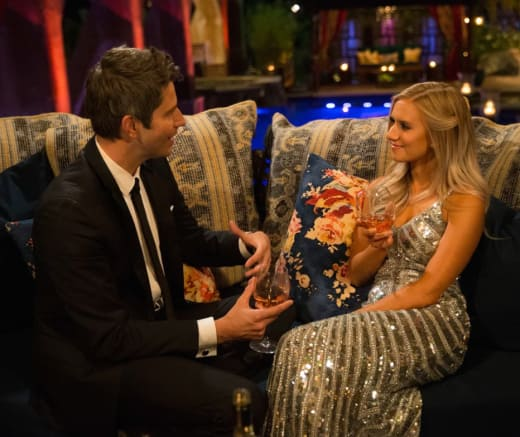 Considering that she’s said about 12 words total this season on air, that was a pretty punny line by the 25-year-old sales rep.
On February 5, Lauren captioned a picture from her first 1-on-1 date with Arie “WOW.” Yup, one word. That’s more Lauren-like. Two weeks later, Burnham posted a photo from her hometown date in which she and Arie are pawing each other under a pier. Man alive, Lauren’s dad jokes are on point. None of this is conclusive proof that they’re still a thing, but it’s hard to see her writing this if she got dumped twice by the same guy. Why come to her defense if he wasn’t still with her? It’s hard to imagine that they’re not dating right now, but are they engaged? According to Steve, they are not. Yet. Given Arie’s indecisiveness, they may never get there. But when the After the Final Rose special airs Tuesday, expect a united front. As for Lauren’s role in breaking up Arie and Becca, she’s guaranteed to take a whole lot of flak in the coming days and weeks. But should she? Did she have any idea this was coming? Is it really her fault if a guy wants her enough to pull this kind of move? For real. This guy is a piece of work. Given that statement and the fact that he called her the night of The Bachelor premiere in January, she likely knew how Arie felt. View Slideshow: The Bachelor & The Bachelorette: 31 Most Stunning Exits Ever! Once he ended things with Becca, Lauren was obviously aware he was coming with cameras to Virginia to beg her for another chance. We’ll have to see how that played out when the five-hour (LOL) finale continues tonight, but she wasn’t opposed to dating him. Grab a hat and hold the f–k onto it. Beyonce’s Twins are Geminis. And They Need Your Prayers. Fergie: Kimye vs Taylor Swift Feud Is A Total Publicity Stunt! Next story Katie Holmes: See? Suri Cruise is Happy Living with Me!